Can Fox’s Empire Continue to Rise in Season 2 After Becoming a Midseason Sensation? Even if Fox suffers a repeat of last year's disastrous fall, during which four of its five new series almost immediately imploded, the network should have a much brighter and more lucrative start to this new TV season. That's because Empire, the hip-hop drama that quickly became a phenomenon after premiering in January, is back for an 18-episode second season, which debuts tonight at 9 p.m. Empire's ratings started high and climbed all season. In live-plus-seven numbers, its finale averaged 23.1 million total viewers and an astounding 9.3 rating among adults ages 18 to 49, making it the highest-rated freshman finale since Grey's Anatomy in 2005. The network hopes to bring back all those viewers who watched last season, along with those who have watched the show on VOD and other platforms since its March season finale (episodes were viewed 500,000 times a week this summer), while also drawing in new audiences. "I think it is a matter of don't mess it up," said Joe Earley, COO, Fox Television Group, of the challenge facing the network. Fox is confident Empire will once again be one of TV's biggest shows (ad rates for tonight's premiere are as much as $750,000 per 30-second spot, according to the Hollywood Reporter), and so are buyers, who are more excited about Empire than any of the new fall series. "We've got to be part of Empire," said Darcy Bowe, vp, media director at Starcom, "How many people watched it on an alternate viewing platform [this summer] and now are going to tune in because now they can't wait to see the next one?" But even as it commands premium ad rates, the network realizes Empire's ratings surge can't last forever. "We have high expectations for how it's going to perform," said Gary Newman, co-CEO and co-chairman of Fox Television Group. "Will the show stay as hot as it was in Season 1? I think it's inevitable that it won't be as hot. It will perform great, but nothing remains a phenomenon for that long. So, we have to be realistic about our expectation levels. But the material that we've seen so far has been great. We feel confident that we have the goods this year." The network has been working since Season 1 ended six months ago to entice the audience to return. "The campaign for Season 2 began with the [March 18] finale for Season 1," said Earley, when Fox announced a #BeonEmpire sweepstakes for the chance to win a role on Season 2. That was part of a campaign Fox called "The Bridge" to keep audiences engaged between Season 1 and Season 2 and expose the series to new viewers. In July, Fox launched the Fox's Next Empire Artist bus tour, which visited 15 cities and offered fans the chance to record a cappella versions of the show's songs and win a chance to appear as an artist on the show. Cast members Jussie Smollett and Bryshere "Yazz" Gray performed on last month's Teen Choice Awards. This month, the network shifted from "The Bridge" to its Season 2 campaign with a "very strong media buy, to remind people who watched the first season that this event is coming, and it is to bring in new people who haven't watched before. And if you just come in fresh, you'll know everything that you need to know to watch," said Earley. Fox brought on Lincoln and Pepsi as this season's official sponsors, with integrations and placements throughout. (Both companies sponsored the show's lavish Season 2 premiere at New York's Carnegie Hall on Sept. 12.) The show has also partnered with Saks Fifth Avenue, which is selling curated collections inspired by the characters. While the network feels like its marketing plan is as solid as Season 2's episodes, one thing is out of its hands—the inevitability of some kind of backlash, which seems to follow every TV show's meteoric rise (see: Friends, Modern Family and Glee). Already, there has been some audience grumbling about the number of high-profile guest stars on tap: Empire's premiere episode includes appearances from Marisa Tomei, Chris Rock, Kelly Rowland and Al Sharpton, with Chris "Ludacris" Bridges and Pitbull set for subsequent weeks. 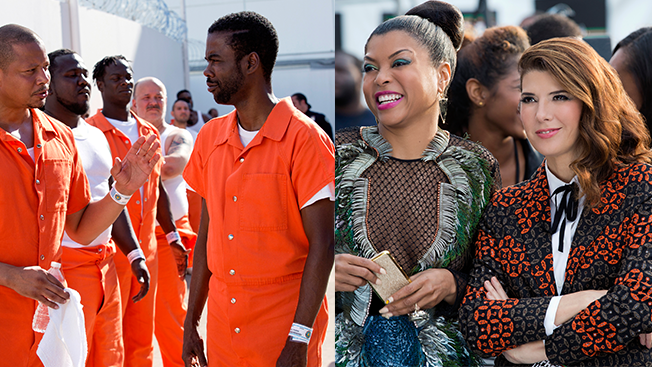 Empire's Season 2 guest stars include Chris Rock and Marisa Tomei. Fox insists, however, that the show's producers will be able to sidestep any land mines. "We have a lot of conversations with our creators about how the shiny object of a guest cast member should never distract from what's going on with our characters that have connected with this audience who they love. They want to see what's happening with these characters on an ongoing basis. So we're pretty clear with them, and they're clear with us, that this show is about the Lyon family and what happens with our series regulars," said Dana Walden, co-chairman and co-CEO, Fox Television Group. Walden added that unlike some shows, Empire's music-industry setting "enables you to organically introduce guest stars. So we don't have to be concerned as with a show like Glee, where the franchise is not as friendly to the idea of guest casts." Message received, said the producers. "We're mindful of all the pitfalls," said Empire showrunner Ilene Chaiken. "Obviously we've observed the ways that certain other shows have stepped into them in their second seasons. We're not actively trying to avoid them—we're just trying to continue doing what we started. We're telling good stories, the best stories we can, about those characters and being rigorous with ourselves to make sure that our stories continue to be the stories of Empire."